The Houston Dash beat the Washington Spirit 1-0 on Sunday morning. The game was originally scheduled for Saturday night, but was postponed to Sunday at 10 a.m. ET due to poor field conditions. The Maryland SoccerPlex was pelted with heavy rain for most of the day on Saturday and the field was deemed unplayable. The Dash are now 6-7-5 with 23 points and moved into sixth place in the standings, five points behind the fifth place Red Stars and six points out of a playoff spot. With the loss the Spirit dropped to 2-12-4 (10 points) and have been eliminated from playoff contention. Houston scored in the third minute on Rachel Daly’s seventh goal of the season. Sofia Huerta earned the assist on the play, her fourth of the year.
.@RachelDaly3 is all ? after her seventh goal of the season. Dash defender Janine van Wyk was injured in the 25th minute and was replaced by Veronica Latsko. The Dash said they would provide additional updates on her injury. 25' Campbell gets a touch on Smith's effort. Dash goalkeeper Jane Campbell earned the clean sheet, making nine saves, including one late in the game on Spirit forward Ashley Hatch. Both teams are now off for the international break and will be back in action on August 5. The Dash will host Utah Royals FC and the Spirit will visit the Reign. Match ends, Washington Spirit 0, Houston Dash 1. Second Half ends, Washington Spirit 0, Houston Dash 1. Sofia Huerta (Houston Dash) wins a free kick in the attacking half. Attempt blocked. Ashley Hatch (Washington Spirit) right footed shot from outside the box is blocked. Assisted by Havana Solaun. Offside, Houston Dash. Jane Campbell tries a through ball, but Nichelle Prince is caught offside. Attempt missed. Ashley Hatch (Washington Spirit) right footed shot from outside the box is high and wide to the right. Assisted by Havana Solaun. Attempt missed. Havana Solaun (Washington Spirit) header from the right side of the six yard box is close, but misses to the right. Assisted by Caprice Dydasco with a cross following a corner. Corner, Washington Spirit. Conceded by Taylor Comeau. Attempt missed. Sofia Huerta (Houston Dash) right footed shot from outside the box is too high. Assisted by Rachel Daly. Attempt missed. Tori Huster (Washington Spirit) right footed shot from outside the box is just a bit too high. Assisted by Havana Solaun. Attempt blocked. Andi Sullivan (Washington Spirit) left footed shot from outside the box is blocked. Corner, Washington Spirit. Conceded by Jane Campbell. Attempt saved. Ashley Hatch (Washington Spirit) right footed shot from outside the box is saved in the top right corner. Assisted by Havana Solaun. Hand ball by Veronica Latsko (Houston Dash). Amber Brooks (Houston Dash) wins a free kick in the defensive half. Offside, Houston Dash. Haley Hanson tries a through ball, but Linda Motlhalo is caught offside. Substitution, Houston Dash. Nichelle Prince replaces Thembi Kgatlana. Corner, Washington Spirit. Conceded by Veronica Latsko. Substitution, Washington Spirit. Havana Solaun replaces Francisca Ordega. Substitution, Houston Dash. Haley Hanson replaces Savannah Jordan. Corner, Houston Dash. Conceded by Andi Sullivan. Attempt missed. Linda Motlhalo (Houston Dash) right footed shot from outside the box misses to the left. Assisted by Thembi Kgatlana. Offside, Houston Dash. Veronica Latsko tries a through ball, but Thembi Kgatlana is caught offside. Attempt blocked. Veronica Latsko (Houston Dash) right footed shot from outside the box is blocked. Attempt blocked. Sofia Huerta (Houston Dash) left footed shot from outside the box is blocked. Assisted by Thembi Kgatlana. Attempt missed. Ashley Hatch (Washington Spirit) header from the centre of the box is close, but misses to the left. Assisted by Tori Huster with a cross following a corner. Attempt blocked. Mallory Eubanks (Washington Spirit) right footed shot from the right side of the box is blocked. Assisted by Andi Sullivan. Attempt missed. Caprice Dydasco (Washington Spirit) header from the left side of the box is too high. Attempt missed. Estefanía Banini (Washington Spirit) right footed shot from outside the box is high and wide to the right. Assisted by Rebecca Quinn. Attempt saved. Caprice Dydasco (Washington Spirit) right footed shot from the left side of the box is saved in the top centre of the goal. Assisted by Tori Huster. Corner, Houston Dash. Conceded by Rebecca Quinn. Delay in match Taylor Smith (Washington Spirit) because of an injury. Second Half begins Washington Spirit 0, Houston Dash 1. First Half ends, Washington Spirit 0, Houston Dash 1. Corner, Washington Spirit. Conceded by Lindsay Agnew. Attempt missed. Rachel Daly (Houston Dash) right footed shot from the right side of the box is close, but misses to the right. Assisted by Sofia Huerta with a through ball. Attempt saved. Estefanía Banini (Washington Spirit) right footed shot from the right side of the box is saved in the top right corner. Attempt missed. Taylor Smith (Washington Spirit) right footed shot from the right side of the box is high and wide to the right. Assisted by Francisca Ordega. Attempt missed. 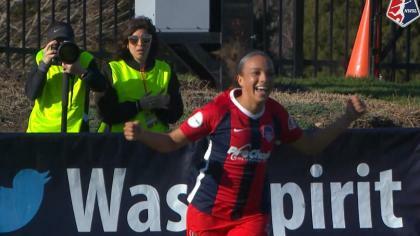 Caprice Dydasco (Washington Spirit) left footed shot from the left side of the box misses to the right. Attempt saved. Ashley Hatch (Washington Spirit) left footed shot from outside the box is saved in the bottom left corner. Substitution, Houston Dash. Veronica Latsko replaces Janine van Wyk because of an injury. Attempt saved. Taylor Smith (Washington Spirit) right footed shot from outside the box is saved in the bottom left corner. Janine van Wyk (Houston Dash) wins a free kick in the attacking half. Corner, Washington Spirit. Conceded by Linda Motlhalo. Attempt saved. Sofia Huerta (Houston Dash) right footed shot from outside the box is saved in the bottom right corner. Assisted by Taylor Comeau. Attempt missed. Thembi Kgatlana (Houston Dash) left footed shot from the left side of the box is close, but misses to the left. Assisted by Clare Polkinghorne. Attempt blocked. Ashley Hatch (Washington Spirit) right footed shot from the centre of the box is blocked. Assisted by Caprice Dydasco. Attempt missed. Estefanía Banini (Washington Spirit) right footed shot from the centre of the box is close, but misses to the right. Assisted by Taylor Smith. Attempt saved. Estefanía Banini (Washington Spirit) right footed shot from the centre of the box is saved in the centre of the goal. Attempt saved. 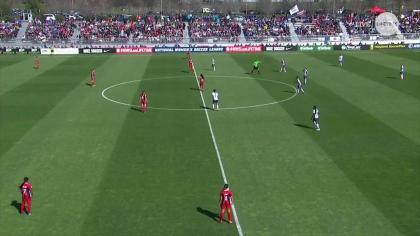 Taylor Smith (Washington Spirit) right footed shot from the right side of the box is saved in the bottom left corner. Assisted by Estefanía Banini. Attempt missed. Lindsay Agnew (Houston Dash) right footed shot from outside the box is too high. Assisted by Sofia Huerta. Foul by Savannah Jordan (Houston Dash). Clare Polkinghorne (Houston Dash) wins a free kick in the defensive half. Goal! Washington Spirit 0, Houston Dash 1. Rachel Daly (Houston Dash) header from the centre of the box to the bottom right corner. Assisted by Sofia Huerta with a cross. Attempt saved. Francisca Ordega (Washington Spirit) with an attempt from very close range is saved in the centre of the goal. Assisted by Caprice Dydasco. Attempt saved. Francisca Ordega (Washington Spirit) left footed shot from the left side of the box is saved in the bottom right corner. Assisted by Caprice Dydasco.